Nokia has bowed to sustained pressure and sacked its president and CEO, Olli-Pekka Kallasvuo, who is to be replaced on September 21st by Stephen Elop, head of Microsoft’s business division. While Kallasvuo has another ten days to fill as CEO, his position on the board has been terminated immediately. He will remain on the board of Nokia Siemens Networks in a non-executive capacity. 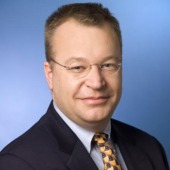 Canadian Elop will be the first CEO of Finland’s most famous corporate entity not to come from the country, and shoulders significant expectations from the board of a turnaround in the handset player’s fortunes. “The time is right to accelerate the company’s renewal; to bring in new executive leadership with different skills and strengths in order to drive company success. The Nokia Board believes that Stephen has the right industry experience and leadership skills to realize the full potential of Nokia. His strong software background and proven record in change management will be valuable assets as we press harder to complete the transformation of the company. We believe that Stephen will be able to drive both innovation and efficient execution of the company strategy in order to deliver increased value to our shareholders,” said Jorma Ollila, former CEO and chairman of the Nokia Board of Directors. For some time Nokia has been losing position in the crucial high end of the handset market, with Apple, RIM and Android manufacturers leading innovation and sales. Nokia’s new flagship smartphone, the N8, is due for release shortly. Any sting that Kallasvuo might be feeling is likely to be soothed by a severance package that sees him walk away with more than €4.6m as well as 100,000 Nokia shares. I think it will surely effect Nokia market and soon you will observe significant change in NOKIA product and service. Nokia was really in deep pressure for appointment of CEO. Lets see what gonna happen with Nokia market. I think Nokia still have potential to gain market attention soon. @Mobile Tech Review: I totally agree with him because if powerful man replaced then what happen all of you know.let see what will happen in future.Nokia need to changed products style.